Thank you for visiting us! If you have stumbled upon us by accident while looking for real guns, then you may be pleasantly surprised to find that none of the guns we feature on this site are real. If that intrigues you, then read on and discover a whole other world of "hobby guns" that has amassed a large following over the last several years. There are well over thousands of airsoft enthusiasts in the US, and many more in the UK. Enthusiasts in Japan number in the tens of thousands, if not several hundred thousand. 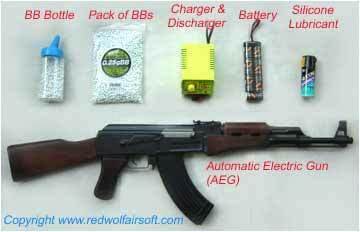 What you see in our online store are not real guns, but are realistic BB firing replicas called airsoft. To understand what airsoft is, it is important to understand what it is not. Airsoft is different from the traditional "BB guns" common in Europe and in the United States, which often fire 0.177 caliber metal BBs (round or pellet shaped) at speeds of 350fps to 1000fps. Power is usually by way of CO2 cartridges or through hand-cocking air power. Some of these BB guns resemble real weapons in their general shape, but in almost all cases they are modified somewhat in terms of details or in the way their switches function. They will also never carry the trademarks or names of their real counterparts. As such, close inspection will always allow you to distinguish between a BB gun and a real gun. BB guns can be used for sport shooting or hunting, but are not suited for indoor shooting or war-gaming due to their high power. These BB guns are incapable of shooting full auto. 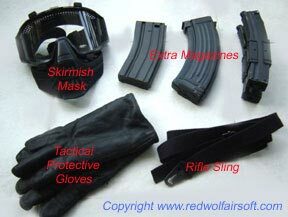 Airsoft is different from paintball guns, which is designed specifically for war-game purposes. These "guns" do not resemble real weapons at all and are usually quite simple in design. Power is by way of a compressed air gas tank that is in its smallest form as big as a coke bottle, that is mounted externally on the paintball gun. Paintball guns shoot plastic balls that are filled with paint, which break up and splatter on the opponent's body upon impact. Given the relatively large size of paintballs, the projectile of each shot is a slight arc rather than a pure straight-line. However when shot at close range, these paintballs can really hurt and cause bruising. The beauty of paintball is your opponent cannot deny being hit due to the visible paint marks that are delivered by the paintball. The only thing that leaves something to be desired is the look of the gun, which is burdened by the huge container for the paintballs, and the external gas tank. Paintball guns are mostly incapable of shooting full-auto. 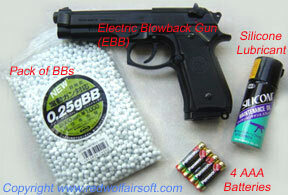 Airsoft BBs are plastic, and are bigger than the US standard metal BB's, but smaller than paintballs. Note that pictured paintball is a small paintball. Paintballs used in the US and UK are typically larger. Airsoft was invented in Japan and describes pistols and rifles that look, feel, and operate exactly like real firearms. Their shape, form, and trademarks are true to form, and almost all airsoft models are actually replicas of real world weapons. Civilian gun ownership in Japan is illegal and airsoft naturally found a large market of gun enthusiasts that wanted to own and collect their favorite weapons but were not ready to break the law for their hobby! As such, authenticity and realism is a top priority for airsoft guns and most manufacturers have licensed agreements with the real gun manufacturers to copy the real gun styles and use their trademarks. In fact, in many cases you can install real gun accessories onto airsoft guns due to their similar dimensions and design. At close range, it is extremely difficult to discern an airsoft gun from real guns. That is why some countries, such as the United States, requires all imported airsoft guns to possess orange painted barrel tips. In fact, airsoft guns are so authentic that many police and military training programs across the world use airsoft products for training purposes. There are many weights and types of Airsoft BBs for different powered guns - but all of them are plastic. At most, they come coated with metal, but are never solid metal. Note that 6mm paintballs have are no longer commonly used since they tend to jam airsoft guns. Airsoft products are not designed to deliver serious harm, and are powered by various methods to propel a 6mm plastic BB at distances of 50 to 200 feet at between 200fps to 600fps. Most airsoft guns are designed to shoot plastic BBs weighing 0.2g to 0.25g. Some of the entry level guns, such as the mini guns and electric blowback guns are happier shooting 0.15g BBs, and modified weapons are capable of shooting over 0.3g. Airsoft guns can be modified to deliver serious power, though not life-threatening. Highly modified and powered-up airsoft guns can break skin and cause bleeding, but will never penetrate flesh or lodge itself under the skin. That is why airsoft is perfect for recreational skirmishing since they are non-deadly - unlike the metal BB guns manufactured by companies like RWS (Europe), Daisy (USA), and Crossman (USA). Yes! Airsoft guns are legal in most countries without the need for a license, including the United States (except in a few States), England, France, Norway, Sweden, Argentina, Russia, Belgium, Switzerland, Italy, and many other places. Some countries such as the United States requires that all imported airsoft guns have painted orange barrel tips. Other countries like England and France require nothing at all and airsoft guns can be imported in their original state. Note that on some airsoft guns, there is no flash hider, or it is not removable. In those instances, we will paint the tip orange. Removing the orange paint is possible with paint thinner but again, we do not encourage it for legal reasons. For more on legal issues, click here. Shooting can be performed in semi-auto, and full-auto on selected models at approximately 10 to 14 rounds per second. For example, Marui's electric MP5A5 machine gun is capable of 12 rounds per second, while KSC's M11 sub-machinegun is capable of delivering 1200 rounds per minute (which is as fast as the real M11). Accuracy varies depending on models but a 1-inch deviance at 20 feet is standard on stock, unmodified models. With the proper modifications and upgraded parts, your airsoft rifle can be deadly accurate and attain a deviance of only 2 inches from 50 feet. There are several types of airsoft guns and they are categorized mainly by their propulsion mechanism. These guns are powered by an electric motor that run off of a rechargeable battery similar to those used in radio controlled cars. The motor powers a series of gears which wind and compress a spring, which in turn is connected to a piston and cylinder mechanism. When the spring is completely compressed by the motor, it is released and exerts force on the piston and cylinder mechanism. This in turn forces compressed air through a nozzle and onto a BB, which in turn is propelled out of the gun. Stock AEGs can deliver BB speeds of 240fps to 285fps using a standard 0.2g BB. Upgrading the spring, and hence the supporting gears, can easily deliver BB speeds of over 400fps or more. To give you a sense of how much power that is, BB!|s fired from factory AEGs cannot penetrate the side of a soda can. However at close ranges (15-30 feet), they can deliver a sting if hit on the human body. Closer ranges such at 10 feet or under can cause a slight welt if hit on bare skin. Stock guns are not designed to break human skin and are therefore perfect for war-gaming and other gaming purposes. They can, however, cause blinding if the BB hits someone in the eye so care should still be taken not to use airsoft guns irresponsibly. In fact, AEGs are recommended for persons 18 years or older. Our line of full-auto electric airsoft rifles include, but is not limited to, the popular H&K MP5 series, the Colt M16 series including the M4A1, AK47's, Steyr AUG series, and even the exotic FN P90. For sniper fans, there is the semi-auto H&K PSG1. All these rifles look EXACTLY like their real counterparts and all switches and levers function in the same way as the real weapons. BB's are loaded in metal removable magazines, of which spares can be purchased from our accessories page. Different capacities exist for magazines so if you don't want to keep reloading or changing clips / magazines, then get an optional Hi-Capacity magazines. For example, the high capacity AK47 magazine can hold 600 rounds! - A battery that suits the gun. These come in different sizes for different guns and our site specifies the size for each gun use list. - Large pack of 0.2g or 0.25g BBs. These go fast when you're shooting full auto at 12 rounds per second, so order plenty if you plan to play a lot. - A BB Bottle to make loading easier. - A battery charger. AEGs use rechargeable batteries which you need to charge. Get a charger to do the job. That's the basics, though most enthusiasts gradually move onto accessories like scopes, slings, combat gear, etc. pressure to a valve on the magazine. This valve in turn releases a pocket of charged gas from the gas container within the magazine, and the gas is used to propel the BB out of the gun. This same pocket of gas is used to also cycle the slide backward, thereby recocking the hammer and chambering the next round. This action causes a recoil effect, though it is relatively weak compared to a real gun. Overall, the operation of airsoft blowback pistols is exactly the same as a real gun. 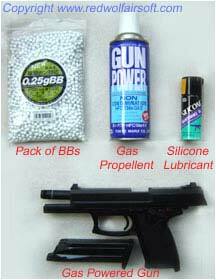 BB's are stored in the clip and are reloadable just like in real pistols. Most modern day real-world pistols are represented in our line-up of gas models, including the Beretta 92F, Glock 17, Colt Government, and many more. Revolver fans will also find a good selection made by Tanaka and Tokyo Marui. Gas blowback sub-machine guns include the M11, Steyr TMP, Micro-uzi, and more. Gas guns typically deliver equivalent power to electric powered guns as described above. Upgrades are also possible to achieve very powerful results. In fact, the upgrade potential for some gas rifles surpasses that of the AEGs. Note that gas rifles and most gas shotguns (except Maruzen's Remington M1100) are not blowback but use essentially the same mechanism described above but without the cycling feature. Of course, using the entire pocket of gas on the BB will generate higher power than when sharing the pocket of gas with the slide cycling action. - A gas powered gun. - Canister of propellant gas, either HFC134a or HFC22, depending on the gun. The recommended type is specified on our site, beside each gun. Hand-cocked pistols are entry level airsoft guns that are quite affordable. They do not use any form of power and requires you to pull the slide back in pre-tensioning a spring within the gun. When the trigger is pulled, the spring decompresses and forces air through a piston onto the BB, which in turn is propelled out of the gun. Hand-cocked pistols, frequently referred to as "spring guns", are a good way for people new to the sport to learn the basics of airsoft. While they are much lighter, are less powerful, and are slightly less detailed and refined in their finishing, they still retain the authentic style and shape of the real gun, and also possess the real trademarks as well. They are quite accurate as well and allow for decent target practice at ranges of 10 feet. Some long bolt action rifles are also hand-cocked but these are not considered entry level and can deliver ample power thanks to their long barrels. - A spring gun or bolt rifle. 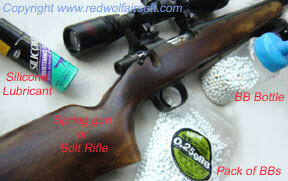 You can opt for an entry level spring gun or a high end bolt rifle. These are relatively new to the airsoft scene and were introduced by one manufacturer in 2000. These entry-level models are not very powerful but using 4 AAA batteries, these guns use a motor to operate in much the same way as an AEG. The added bonus is the motor also cycles the slide on pistols. Electric blowbacks are designed for those who want to experiment with airsoft and want semi-auto functionality. However serious shooters and airsoft fans should opt for gas blowback pistols, which deliver far greater power, recoil, realism, accuracy and range. These fire in semi-auto mode, and are very light and basic on the details. - An EBB gun. Shop here. These are toy variants that are scaled down versions of real guns. They use batteries and fire BBs out in full auto. Power is very weak but they make great plinkers at home and in the office. Serious airsoft fans should opt for all above options. To start on electric blowbacks, you'll need to obviously get a gun, and 4 AAA batteries, and a pack of 0.2g BBs. To enjoy the true spirit of airsoft, one must have experience in shooting a full-auto AEG or a gas blowback pistol. Words can hardly do justice to describe the fun in spraying targets with 12 -15 rounds per second, or the excitement of shooting a recoiling airsoft pistol. Have you dreamt about shooting an AK47, a silenced MP5 SD5, or even the exotic FN P90? How about emptying a Glock 17 or a full auto Glock 18C at targets. What about the hot high speed M11? How about taking out war-game opponents from a hill with your H&K PSG1 rifle? What about experiencing an all out simulations war-game with your friends and be able to walk away from exciting and adrenaline pumping battle at the end of the day with a smile (even after being hit?). "Airsoft makes dreams come true." Depending on what type of gun you would like, and how many accessories and what types of power upgrades you wish for, the cost can vary greatly. A typical spring gun package will cost around USD$60 while a standard AEG package will run several hundred. You can estimate your price by simply browsing our shop pages to determine the total dollar amount of the products you desire. RedWolf Airsoft does not encourage using airsoft weapons in public or displaying them in any manner to unknowing parties who will believe they are real. Doing so will bring yourself in danger with law enforcement authorities and possibly cause severe injury or death. There have been publicized cases where people have brandished airsoft weapons publicly in an irresponsible manner, and have been injured or killed by law enforcement officers. Please be sensible when enjoying airsoft, and keep it safe! RedWolf Airsoft installs a blaze orange plastic flash-hider on most model AEGs, and also ships the original flash-hider to you as well. This will allow the gun to comply with the law and make it past customs. You can choose to replace the blaze orange flash-hider with the original one, though we encourage you not to take your airsoft gun out into public should you choose to do this. On some guns like the MP5SD series, there is no flash-hider so we are forced to paint a thin stripe of orange on the silencer muzzle. Similarly, gas blowback handguns and revolvers also have their tips painted orange. RedWolf Airsoft installs blaze orange flash hiders on guns shipped to the USA to comply with import regulations. We also ship the original black metal flash hider should the guns be needed for theatrical purposes. If all this seems to interest you, then reading our extensive reviews database will give you a taste of what is out there in the world of airsoft. Once you get a better sense, go here to start shopping for your first airsoft gun and begin the experience that is taking the world by storm.